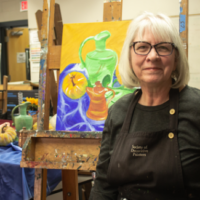 Newman University said goodbye to its longtime Registrar, Shirley Rueb, who retired just before the fall semester began. 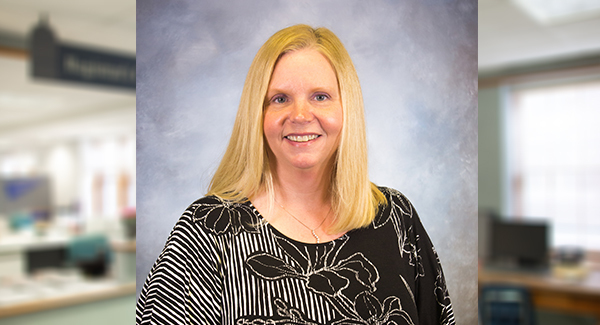 Filling her shoes is Lori Gibbon, who brings many years of higher education experience with her, both as registrar and serving in other important roles. Gibbon earned both her Bachelor of Arts and Master of Arts in social and public policy from Duquesne University in Pittsburgh, Pennsylvania. Gibbon said her experience at Duquesne was one of the reasons why her transition to Newman was so smooth. Gibbon said she is excited to help the registrar’s office continue creating a more efficient and technological process. She said communicating with other departments is also something she’s looking forward to. “I started searching for registrar jobs, looking nationally, and Newman popped up. I hadn’t heard of Newman before so when I looked at the university’s profile and website, I knew something was right. It spoke to me, really. Not to mention, Gibbon said her regalia from Duquesne University is the same school colors as Newman, so when she dons her gown and hood at the Newman commencement ceremonies, she will fit right in. Gibbon said she’s excited about the very capable staff she has and the incredible support she’s received from the Newman administration. “People here are amazing. I said when I interviewed, I felt like I could walk into tomorrow and feel like I’ve always been here. And that’s exactly how I’ve felt. Everyone has gone out of their way to help me transition and hear my ideas. I’ve excited about how eager people are to hear my thoughts and opinions.